The latest update to Apple’s Numbers app includes a new STOCK function that allows a spreadsheet to retrieve stock information from the internet. Update: In the Numbers for Mac 4.2 update, Apple changed the STOCK and CURRENCY functions to return data from the previous market day’s close. 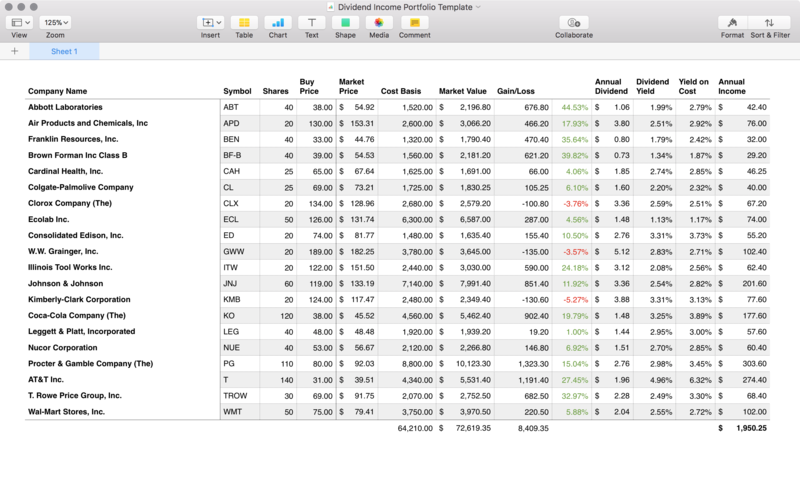 Using this feature, I’ve created a spreadsheet template for tracking a dividend income portfolio. You may download and use this template for free. This spreadsheet helps with the planning, management and maintenance of your portfolio. The amount invested in each equity. The current market price and value of your equities. The gain/loss for each position. The annual dividend and current dividend yield for each position. The annual dividend income for each position. The dividend yield based on the amount you paid. The total amount invested, value, and gain/loss for the portfolio. The total annual dividend income for the portfolio.